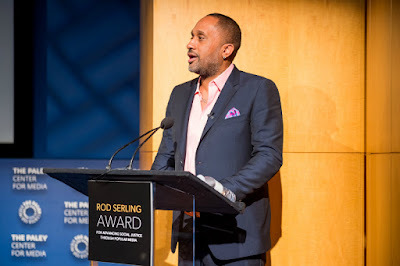 An emotional Kenya Barris, creator of the ABC sitcom “black-ish,” accepted the Rod Serling Award for Advancing Social Justice Through Popular Media on Nov. 16 at the Paley Center for Media in Los Angeles. He spoke passionately about the importance of coming together and having difficult dialogues for the good of the country in the wake of the presidential election. Barris did not shy away from the political in his acceptance speech, calling the election a “gut punch” for many Americans who had hoped for a different result. He said that the country can move forward if people are willing to open their minds and have challenging conversations, likening it to shining a diamond by scratching it first. “I think that we can really come together and use whatever experiences we have to make the next 4, 8, 12, 20 years of our lives a more enriched, a more fulfilling and a more honest and open community for all of us and our children,” Barris said. Established by Ithaca College, the award honors Rod Serling and his pioneering efforts in the television industry and recognizes a modern media professional whose work raises awareness of prejudice, inequality and society’s changing social norms. Serling taught at the college from 1967 to 1975. Barris praised Serling, noting that as a child he often spent Thanksgiving watching a marathon of Serling’s “Twilight Zone” on television. But he said that it was only when he grew older that he truly appreciated how Serling’s work encouraged viewers to think hard about serious issues — something that Barris has tried to do in his career. “I think that I’ve been given a unique opportunity to tell a story and start conversations, and I think that’s the most important thing that any artist can do,” Barris said. “Black-ish” star Marcus Scribner introduced Barris. He called Barris a role model and praised his willingness to let audiences think for themselves about important societal issues. “Kenya trusts the audience to make their own intelligent and thoughtful decisions and come to their own conclusions about what they’ve seen,” Scribner said. Diane Gayeski, dean of the Roy H. Park School of Communications at Ithaca College, also made introductory remarks. She drew a comparison between Barris and Serling as artists willing to engage in difficult dialogues through their work. “Kenya Barris is the person who deserves this, and the person who in our minds takes Rod’s legacy and moves it forward and lives that every day,” Gayeski said.